While most of us were falling asleep watching Manchester United’s bore draw in Sevilla on Wednesday night, the football hipsters of the world were watching Shakhtar Donetsk deliver yet another sensational home performance, as two of the Champions League’s dark horses battled it out in Ukraine. The Ukrainian side beat Italian giants Roma 2-1, a result that might have been even more flattering if not for several fantastic saves from Roma keeper Alisson. Shakhtar have four wins from four at home in the Champions League this season, including impressive victories over Manchester City and Napoli. A major part of the club’s success in recent years has come from their Brazilian contingent, breeding exciting players like Willian, Alex Teixeira and Fernandinho before moving them along for a tidy profit. The next in Shakhtar’s remarkable production line of talented Brazilians is Fred. According to some reports, the midfielder is set to join Manchester City this summer in a deal worth up to £50million. 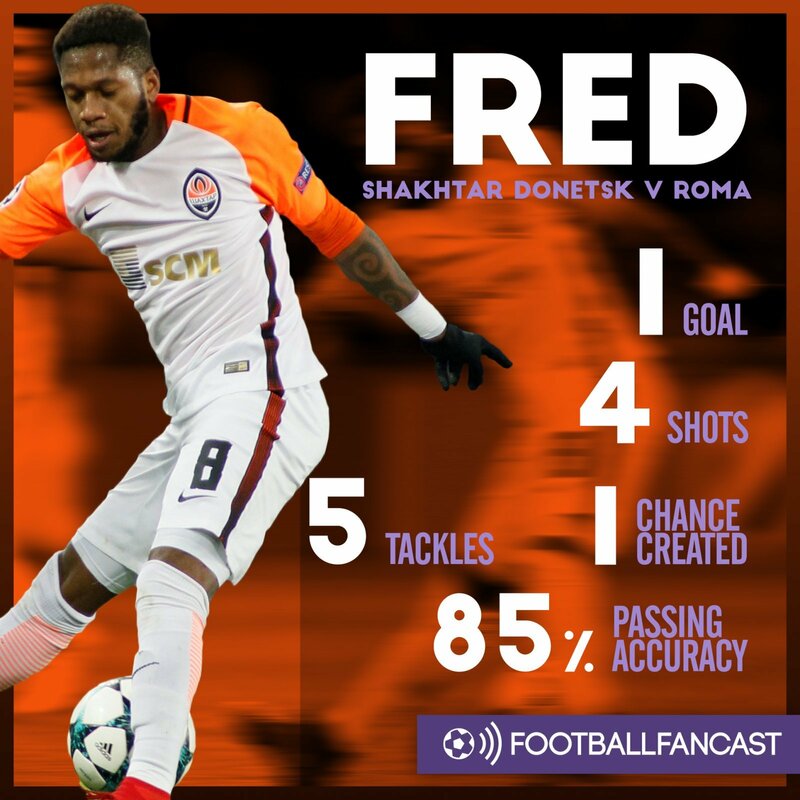 The Premier League leaders were strongly linked with a move for Fred in January, but it is reported that Shakhtar were unwilling to sell their star man while still in the Champions League. The 24 year-old defensive midfielder delivered yet another marvellous display on Wednesday night, scoring the winner with a free kick his compatriot Juninho would have been proud of. Blessed with great athleticism, the Brazilian is seen as a long-term replacement for 32 year-old Fernandinho, and with performances like Wednesday night’s it’s not hard to see why. Similarly to Fernandinho, Fred is excellent at reading the game and sniffing out attacks before they even begin, registering an incredible five tackles against Roma (no other player had more than three). He’s not just a traditional defensive midfielder though, as he also registered four shots and one created chance. This is not atypical of the season Fred is having, averaging three dribbles, two shots and a key pass every game. It is not often a player bosses a Champions League knockout game in the manner Fred did on Wednesday night, only to cap it off with a curling free kick to put his team half way to the next round. His defensive contribution is just the tip of the iceberg, and his eye for a pass and ability to break lines with his dribbling would certainly improve Pep Guardiola’s Manchester City side. The Brazilian midfielder has enjoyed a fantastic season and seems to be getting better every week. He may just be the perfect candidate to fill the ageing Fernandinho’s boots. So, Manchester City fans, would you back a £50million move for the 24 year-old? Let us know your thoughts.